This is the last of the "lot" series of posts -- the lot is finally, undeniably, a LOT. And it is indeed a lot of lot -- with the 18' right of way in front (the first 18' of lawn), it's about 80'x150', or nearly 12,000 square feet (well over a quarter acre). The work wrapped up on Friday, with the excavator hanging out over the weekend (the machine, I mean; not Tim, its driver). Now we have a long wait while we have the soil samples drilled, get the foundation engineered, and get bids. We hope to start construction as early in October as possible, but that depends on how long it takes to get bids, meet with our lawyer to hammer out a contract, and get through the city's permit process (which will NOT involve me going down to the development office -- that'll be the builder's problem from now on!). Normally the spray foam would be in the attic, but this second-story room has a vaulted ceiling, so there's no attic above it. 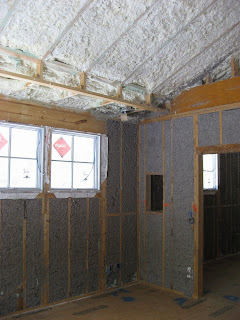 When spray foam is used in the attic, though (as it is in other parts of this house), it's applied at the top of the attic (the underside of the roof), making the entire attic space insulated, so it stays pretty cool (within 10 degrees of the conditioned space, instead of 50+ degrees warmer in the summer). The air conditioning system is also a lot more efficient when the inside unit and the ductwork aren't working under such extreme conditions. When all of this is taking place under a metal roof (shown above the screened porch below), which reflects heat instead of absorbing it, the house uses much less energy to stay cool. Throw some solar panels up on that metal roof, and you save even more. We're so fortunate to be doing all of this at a time when energy efficient materials and systems are so accessible. We hope to install enough solar panels to cover all of our electricity needs, at least at certain times of the year. The city will buy back any power we don't need (but at wholesale prices, which are about a quarter of what we pay), and we will "settle up" monthly, so if we generate a bunch during the day but then turn on all of the lights and do lots of laundry at night, we'll just take back some of that day's production (sometimes the number on the meter will increase, and sometimes it will decrease). In essence, the grid will work as a battery for us. Eventually the city may start paying retail prices or may move to settling up annually, which would be more beneficial for us if we generate more than we need during the winter but less than we need during the summer. But since they are going to pay about two-thirds of the cost of the solar panel system, they can dictate the terms of buying back any excess.